The world of fashion is fleeting and ever-changing. With each season, trends are introduced, reconstructed, and promptly disposed. This past year, we saw a contrast between the incredibly loud to the impeccably subtle. Within four short seasons we visited the '50s, '60s, '70s, '80s and '90s. As we moved through 2014, we tapped into our inner flower-child, borrowed from the boys, went wild for animal prints, visited the heartland, learned new ways to reveal skin, yet also satisfied seasonal classics like pastels for spring and furs for winter. 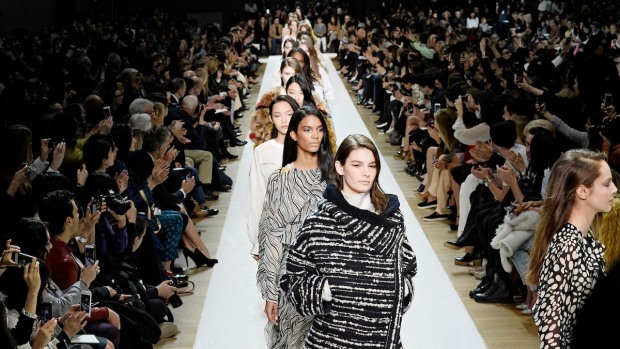 As much as we are enjoying the retrospectives, fashion is very much about the future and 2015 is already shaping up to look like another exciting year for ready-to-wear. 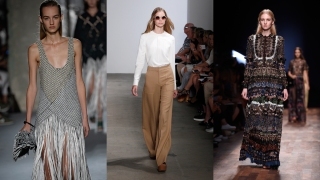 During the recent monthlong parade of shows in New York, Milan, Paris and London, international designers seem to agree on what feels like a definitive message for the Spring Summer 2015 season: 70s chic. “It was remarkable how much solidarity there was among designers in pushing forward a new look, albeit one that was largely rooted in an aesthetic that was inspired by the easy fashion of the 1960s and a somewhat hippie vibe of the 1970s,” said Eric Wilson, fashion news director at InStyle magazine. Its influence was overarching, evident in the fringes at Proenza Schouler and Alberta Ferretti, flared pants at Derek Lam and Celine, bohemian flowy dresses at Pucci and Etro, fur vests at Tommy Hilfiger and Gucci, and patchwork at Yves Saint Laurent and Valentino. But, it wasn’t all peace and love on the runways. Ralph Lauren and Marc Jacobs, among others, went for a more utilitarian look with deep cargo pockets, tailored silhouettes, khakis and olive drab — think somewhere between military-chic and safari luxe. There were also Japanese inspirations, asymmetrical hems, androgynous tailored suits, and denim galore. Perhaps the most surprising trend to come next spring and summer is the fall staple, leather. “Certainly 'summer leather' is a new category that looks promising, partly the result of technical advancements that have resulted in lighter weight materials, even perforated leather that feels cooler in warmer months, and partly the result of the fact that spring clothes now go into stores so early that they need to address multiple seasons' weather,” says Wilson. As we brace the current arctic blasts swathed in cozy sweaters and coats, check out the gallery at the top of the story for a peek at the spring 2015 looks soon to be arriving in stores.